The Atlanta rapper encounters a dark scene as he drives through the city at night in the official video. After teasing the video earlier this week, Future has dropped the official "Mask Off" visual. In the big budget video, which you can see above, Future drives past as an armed robbery spills out onto the street. The dark and murky scene is filled with flaming trash cans, a snake, multiple flute players, and Amber Rose in the passenger seat. Later on we see the armed robbers clashing violently with police. 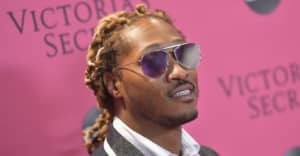 The Colin Tilley-directed video comes after "Mask Off" went platinum and became Future's highest charting single to date. Check it out above.